Bicycles will be allowed on Edinburgh’s trams in a British first – but not during rush hour, the Evening News can reveal. Passengers will be able to travel with their bikes along the £776 million eight-mile line extending from Edinburgh Airport to York Place from next year – but only out of peak hours, according to council chiefs. The step – designed to encourage more people to cycle around the city – will be trialled after an initial start-up phase of the trams project. But it’s already raised disappointed eyebrows from some would-be commuters who think it’s a shame they won’t be able to pedal and tram their way in and out of the city. Bicycles, other than fold-up models, are currently banned on tram networks in other UK cities, including Manchester, Birmingham and Nottingham. 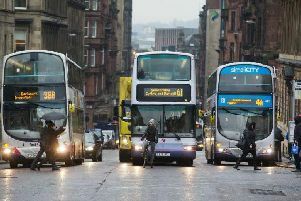 Passengers are also not allowed to take ordinary bikes on to buses in Edinburgh. Travelling with bikes on trams is expected to still be banned from 7.30am-9.30am and 4.30pm-6.30pm on weekdays. The decision on when to start the trial will lie with trams operator Lothian Buses. Ian Maxwell, board member with cycling campaign group Spokes, said: “We know that loads of European tram systems have no problems with allowing bikes off-peak and yet in Britain it’s always been taboo. We’ve been saying for a long time that Edinburgh should just sweep away that concern and go ahead with allowing bikes. It doesn’t cost anything more, it would be at the discretion of conductors. It would just be an extra feature of the trams system. The council also wants to install parking for bicycles around city centre tram stops. The move to trial bicycles on trams was discussed at an annual two-day light rail conference in Manchester attended by Cllr Hinds, council chief executive Sue Bruce and three other elected members last month. A workplace parking levy introduced in Nottingham where city centre businesses pay a tax on their allocated bays to help fund new tram lines and other public transport improvements were among other raised topics. The English city collected £8m in the first financial year after introducing the charge in April 2012.